The DNA replication process, which takes place every time a cell divides, also triggers repair of DNA damage, researchers from the University of Copenhagen have described in a new study, where they have studied extracts from frog eggs, whose proteins are very similar to those of human cells. The researchers hope the new research results can be used to develop more effective treatments for cancer in the long run. 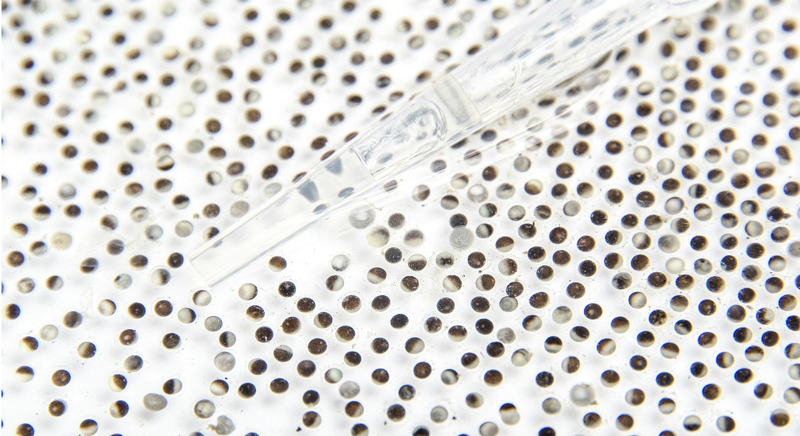 Frog eggs used in the study which are xenopus laevis eggs. Photo: Christian Arán. The body’s DNA is subject to constant damages and lesions, which the body must repair. But precisely how the body does this, has not been established in full. Now researchers from the University of Copenhagen have uncovered some of the pathways used by the cells to repair DNA damages. The research results have been published in the scientific journal Molecular Cell. Harmful DNA lesions may occur in a number of ways and can both be a result of internal and external factors. The type of damage studied by the researchers is called DNA-protein crosslinks. It is a type of damage that is very difficult to study. To do so, the researchers prepared protein extracts from frog eggs, which recapitulates the repair of the lesion in a test tube. These extracts contain the same proteins that are found in human cells, and therefore represent a good model to study these lesions. ’It is vital to understand how these damages are repaired, because if they are not corrected, the body will develop cancer and accelerated aging. But it is also central knowledge with regard to cancer and chemotherapy. Most chemotherapeutic agents deliberately induce these kinds of damages. If we are able to understand how the damages are repaired, we can use that knowledge to develop a form of combination treatment, where we induce damage, on the one hand, and inhibit the cancer cells’ repair hereof, on the other. This would give us a more efficient way of killing cancer cells,’ says last author of the study, Associate Professor Julien Duxin from the Novo Nordisk Foundation Center for Protein Research. DNA damage inhibits cell division, and that is also how many forms of chemotherapeutic agents kill cancer cells. The researchers have discovered two methods or pathways used to mend DNA-protein crosslinks. At the same time, they have established how DNA replication triggers these repair processes. Associate Professor Julien Duxin compares DNA replication to a motorway and a lesion to a roadblock or a large rock in the middle of the road. For DNA replication to take place and be successful, the roadblock must first be removed. ‘Cancer cells divide faster than normal cells and therefore require more DNA replication. They are therefore very sensitive to damages that disturb the replication process. However, DNA replication can also trigger damage repair. For example, you can compare DNA replication to a motorway filled with cars. If you place a rock in the middle of the road, where no one drives, no one will notice the rock. But if you are on a road that is blocked, you will realise that there is a problem that requires solving,’ says Associate Professor Julien Duxin. Cancer cells are clever and often find a way to repair themselves. For example, chemotherapy for one type of cancer cells may work for a period of six months and then stop working because the cancer cells have found a new way of removing and repairing lesions. Therefore, the next step for the researchers is to continue to study these lesions and seek to identify more pathways in which they are repaired. They focus especially on the types of DNA damages that occur during chemotherapy and how they are repaired. Read the scientific study: ’Replication-Coupled DNA-Protein Crosslink Repair by SPRTN and the Proteasome in Xenopus Egg Extracts’. The study is funded by the European Research Council under the EU research and innovation programme Horizon 2020, The Novo Nordisk Foundation, the Center for Integrated Protein Research Munich, the German Research Foundation DFG, the American Cancer Society via a postdoc scholarship, the Damon Runyon Fellowship, and the American research agency National Institute of Health (NIH).